Join our experienced captain for a sail around the Wrightsville Beach area on our private Cruise. For beginner and experienced sailors alike – no experience or hands on participation necessary! Our cruise is our most popular option and a great choice to enjoy your time on the water in a unique way at Wrightsville Beach! A $30 booking fee is required at the time of booking; balance due at time of sail. 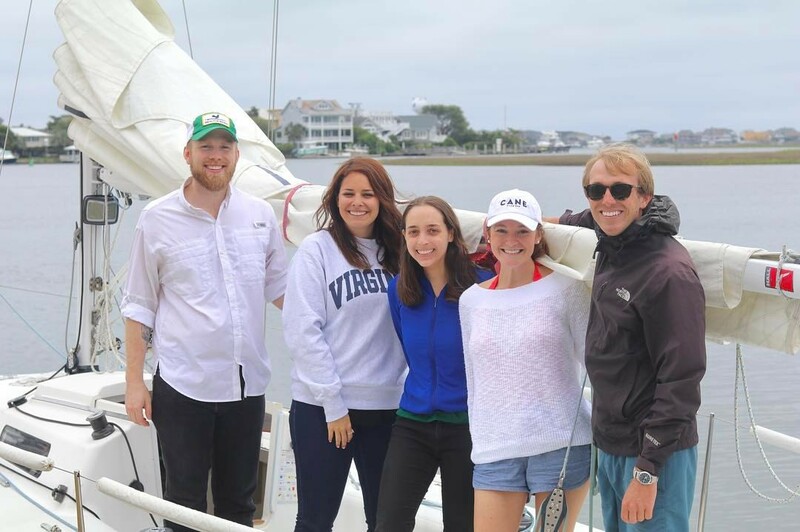 Sailing tours and cruises at Wrightsville Beach offer an unforgettable experience for your family, friends or colleagues. Adventure with us and enjoy one of the best things to do near Wilmington. Departing from Seapath Yacht Club, with free on site parking. You will head out on the water from Motts Channel towards Banks Channel and sail beyond, conditions permitting, into the Atlantic Ocean. If you have not sailed do not worry, we have all the safety gear and experience to make your first adventure seamless and smooth. Our J/80 racing sailboat is kept in excellent condition and with our skilled captain at the helm, affords you an experience unlike any other. Founded in 2014, we strive to ensure your experience is five stars. See what others have to say in our reviews section. Book today! Call or email us with your preferred date and time. You can also connect with us on the contact form below.